TUMBLR 101: How and when to integrate your brand on the hot micro-blogging site. You’re forgiven if you’ve never heard of Tumblr, but you should definitely consider adding it to your new media arsenal. Tumblr is a short-form, social blogging platform, that is on an explosive growth phase. In September, it hit 10 billion page posts, and it’s getting 13 billion page views/month. This alone should pique your interest. Tumblr’s ease of use, customization options, metrics and transparent integration with your other channels, is what makes it really indispensable. Tumblr is not a replacement for your standard blog, run through WordPress, or your own site—long-form articles and case studies are still best presented through these services. 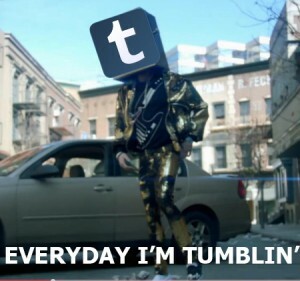 Where Tumblr really shines, is on highly-visual blogs. Images, videos, audio files and quotes, are all presented in a rich environment that is highly-customizable and best of all, is free. Brands that have access to large amounts of this type of media are the ones that thrive here. You can use your own custom URLs, and they have a large collection of themes that are free, or available for a small fee. If you have the skills or budget for it, you can create fully-branded content from the ground up, as well. Tumblr allows for seamless sharing of your content by other users, and thus, extra views for your own page. It is social blogging at its best. Tumblr is not for every brand, though. Retail brands that wish to show new collections, event photos from your company or client, sharing new work, micro-sites on the cheap, and pop-up stores are what it’s best suited for. As with any social media platform, you should be interesting, consistent, and social. You should keep your pages fresh, and most importantly, you should interact with the Tumblr community as a whole. Every time you share something from another Tumblr, answer a question, like a post and add a comment, is an extra link to your own page. Below are some examples of brands and people that have done it right. How will Tumblr inspire your next project? Let us know, and share your Tumblr pages if you’ve already got them.